A hardy plant suitable for beginners. 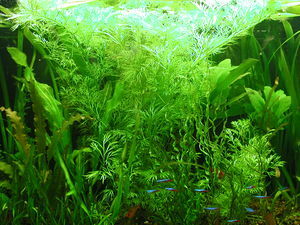 Requires good lighting, and will eat up nutrients to help prevent algae problems. Can over-shadow smaller plants, and if CO2 is in use can over-run the tank. 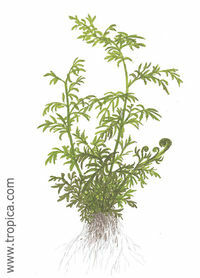 Can be used as a floating plant, very good for tanks raising livebearers. When rooted the crown will grow larger and larger fronds until you have to trade it in for fish food credit at your local pet store. No effort is necessary. Broken bits of leaves will grow roots and larger leaves. If planted in the substrate the plant will form immense crowns, any cuttings or breakage will result in new plants. A bushy plant with fern-like leaf. This page was last edited on 20 August 2011, at 01:16.